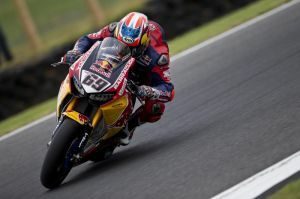 The opening day of action of the 2017 FIM Superbike World Championship has been contested at the Phillip Island Grand Prix Circuit in Australia, with Nicky Hayden able to claim an eighth place in the combined times of today’s two free practice sessions. Courtesy of this result, the 35-year-old American rider has gained direct access to tomorrow’s Superpole 2, while his Red Bull Honda World Superbike teammate Stefan Bradl will try and make his way through the first qualifying session after finishing the day in sixteenth position. Hayden was able to take the best out of the new Pirelli spec tyres brought for the Australian round as he clocked in 1’31.099s on board his Honda CBR1000RR Fireblade SP2 machine in the first free practice session. Bradl significantly improved his feeling with the bike in the morning after working extensively with his crew on the electronic side of the brand-new Honda motorcycle. World Superbike action will resume tomorrow morning at 10:20 local time (GMT+11) for the 25-minute free practice 3 session, with Superpole 1 and Superpole 2 set to get underway at 12:30 and 12:55, respectively. The opening race of the season will start at 15:00.